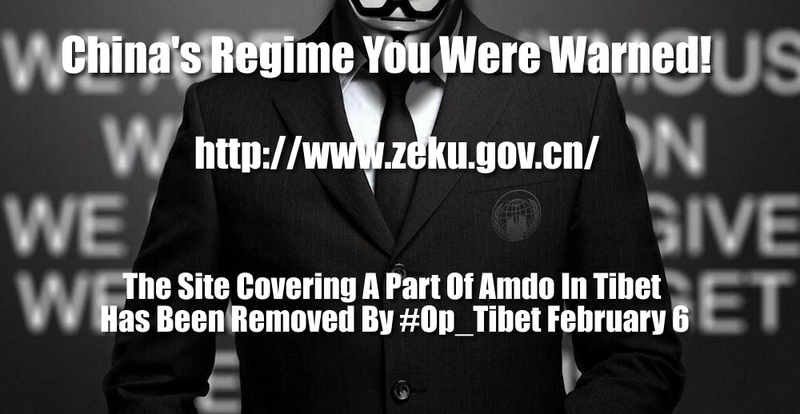 Couple days back we posted a video released by Anonymous activists who run ‘Operation Tibet‘ in which China’s regime was challenged over its actions in Tibet, well just 24 hours later and we learn from our friends over on Twitter that a Chinese government website, that promotes propaganda regarding an area within the occupied Amdo region has today been crashed by Anonymous. The site http://www.zeku.gov.cn/ has been removed. Thanks to @AnonymousTibet for news of this latest action and to @ProjectInject for posting a link to the image above. ← Darth Vader Turns To The Tibetan Side!